Hicks, T. (2013). 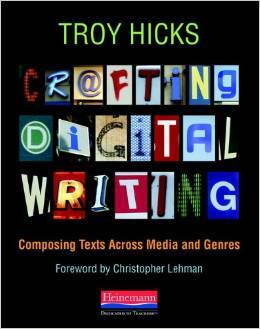 Crafting Digital Writing: Composing Texts Across Media and Genre. Portsmouth, NH: Heinemann. Written for teachers of writing by a teacher of writing, Crafting Digital Writing is both an introduction for teachers new to digital writing and a menu of ideas for those who are tech-savvy. 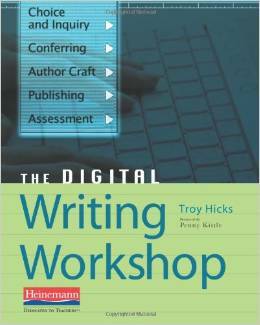 Troy Hicks explores the questions of how to teach digital writing by examining author’s craft, demonstrating how intentional thinking about author’s craft in digital texts engages students in writing that is grounded in their digital lives. 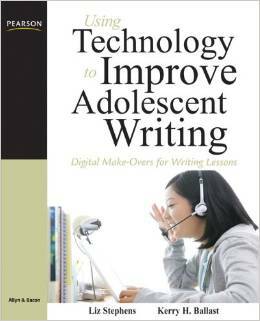 Hicks shows you how to use new technologies to enhance the teaching of writing you already do. Chapters are organized around the familiar principles of the writing workshop: student choice, active revision, studying author’s craft, publication beyond the classroom, and assessment of both product and process. In each chapter you’ll learn how to expand and improve your teaching by smartly incorporating new technologies like wikis, blogs, and other forms of multimedia. Throughout, you’ll find reference to resources readily available to you and your class online. He also includes a practical set of lessons for how to use wikis to explore a key concept in digital writing: copyright. Stephens, L., & Ballast, K. (2011). Using Technology to Improve Adolescent Writing: Digital Make-Overs for Writing Lessons. Boston, MA: Pearson. Looking to capture the attention of adolescents’ in the classroom? In Using Technology to Improve Adolescent Writing, Stephens and Ballast guide teachers in successfully implementing technology for writing across the curriculum while helping adolescents’ develop life-long writing skills. Outlined are four frames of writing: inside, responsive, purposeful, and social action. The student-centered, inquiry-based model connects real-world online writing with content area standards in reading and writing to help teachers teach every student to write in- and out- of school! National Writing Project, DeBoss, D. H., Eidman-Aadahl, E., & Hicks, T. (2010). 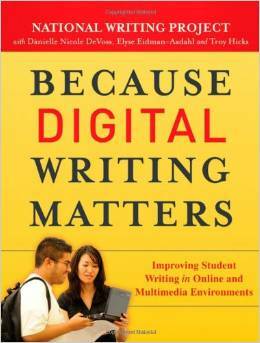 Because Digital Writing Matters: Improving Student Writing in Online and Multimedia Environments. San Francisco, CA: Jossey Bass. How to apply digital writing skills effectively in the classroom, from the prestigious National Writing Project As many teachers know, students may be adept at text messaging and communicating online but do not know how to craft a basic essay. In the classroom, students are increasingly required to create web-based or multi-media productions that also include writing. Since writing in and for the online realm often defies standard writing conventions, this book defines digital writing and examines how best to integrate new technologies into writing instruction. Shows how to integrate new technologies into classroom lessons Addresses the proliferation of writing in the digital age Offers a guide for improving students’ online writing skills The book is an important manual for understanding this new frontier of writing for teachers, school leaders, university faculty, and teacher educators.